Pink Castle for Pink Saturday! 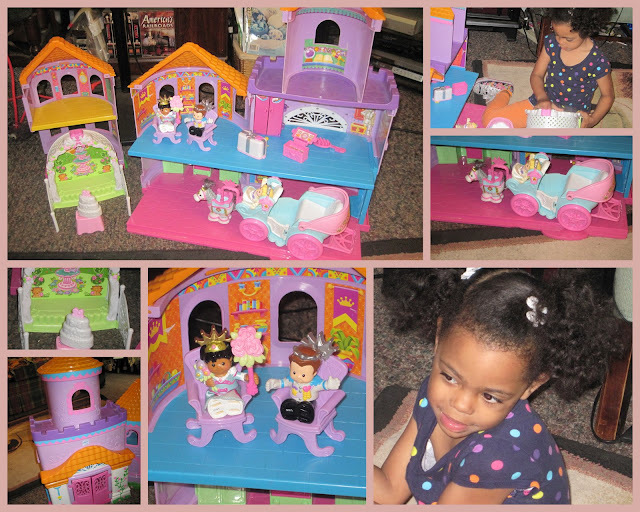 When we celebrated the April wedding of the Royals ... Phoebe enjoyed a new gift! I found this great castle ... in perfect condition ... at GoodWill. Then, I got online and found all kinds of royal "Peoples" ... a princess wedding, complete with a carriage and a horse ... thrones ... a wedding cake and gifts! Phoebe's favorite color is not pink ... it is blue! Thank goodness part of the castle was blue! 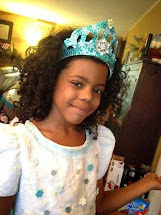 I'm participating in Pink Saturday so make sure you click through to see the rest of the posts! 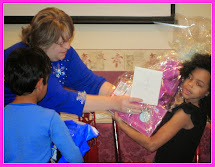 Special thanks to our hostess for giving us a reason to keep pink in our lives! Foyer Table Spiffed Up a Little! I've been doing a little shopping through the house and changing some of my decor ... thought you my enjoy my cute little bears from Pigeon Forge ... from the Old Mill Pottery. The little wooden church was made by my daddy ... when my 1st grade Sunday School class didn't have an offering box for us to drop or change in ... my daddy made a cute little church. It stayed with the church for years and one time I found it just stashed in the back of a craft closet, so I swiped it! God will probably get me for that someday! Our foyer table has been with us for 30 years and the wine bottle/glass holder was a gift from my husband 20 years ago ... so was the beautiful blue and white jar. 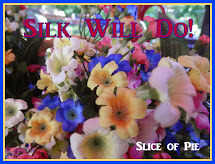 It's held numerous silk flower arrangements through the years! The dust has been with me all summer! I'm linking to Tabletop Tuesday so make sure you click through to visit the other posts. 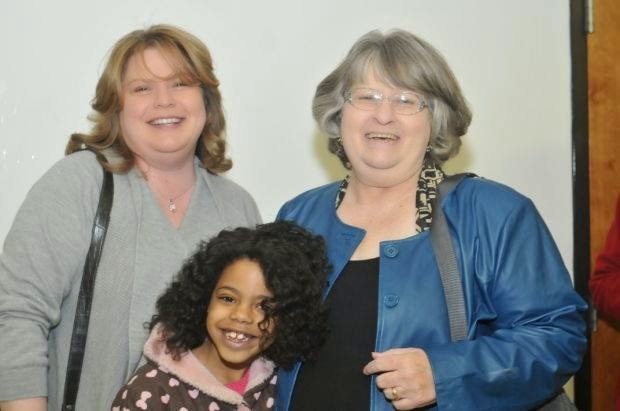 You might also want to visit Ginger, also known as Savannah Granny so see her post about our recent meeting. Blog friends for life! You'll enjoy the post. My Babies are Waiting for Company! A Pizza Party is about to happen and the boys are patiently waiting for company! 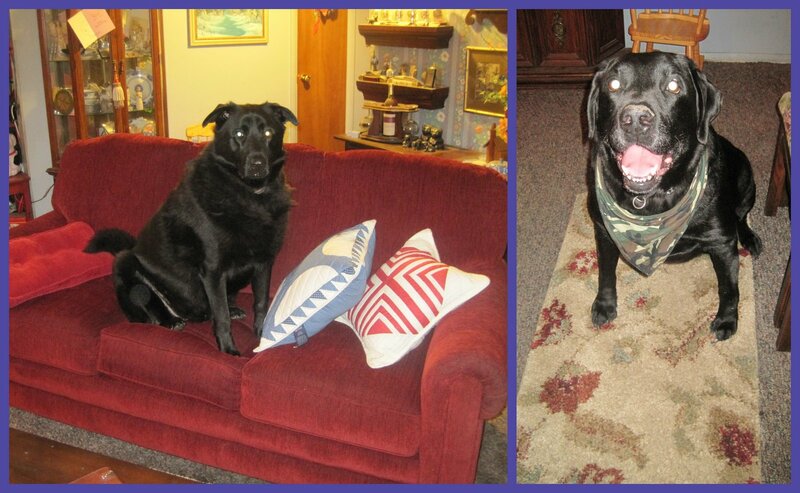 Jimmy Mutt is guarding the new red sofa ... and Junior is sitting on his favorite shag rug! The family finally arrived, followed by the pizza delivery guy! 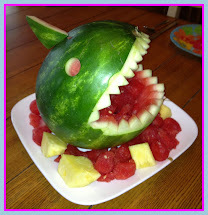 I originally posted this in March 2011 and it is one of the most visited posts I've ever done! So, I'm re-running it with Sunday Favorites! 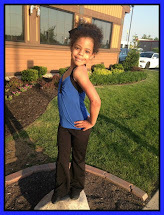 Make sure you click through to see all the other neat posts and special thanks to our hostess! 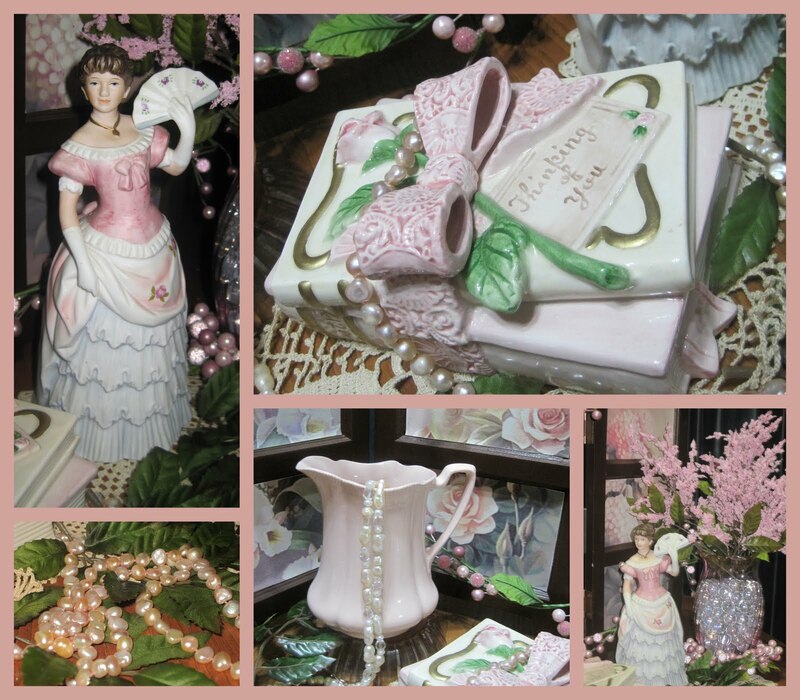 I'm so glad that March arrived because my favorite little museum shop has opened for the season! I visited over the weekend and bought some cuties that I'll post for the cloche party ... but for TT, I'm posting something I bought the last day they were open in December! I spent less than $100 and bought a set of Noritake Anticipation ... 8 place settings with some extra pieces ... and it is almost embarrassing that I paid so little for this china that looks like it has never been used. 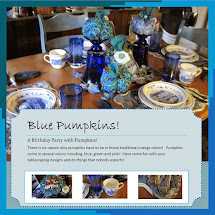 I'm partying with Tablescape Thursday, so make sure you visit Susan at Between Naps on the Porch to see all the other party posts! Special thanks to Susan for giving us this neat opportunity! 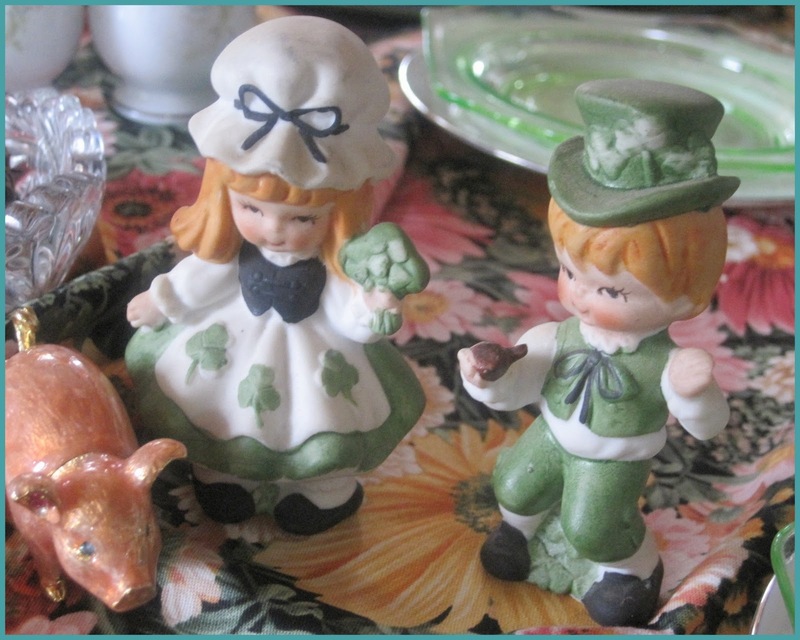 I'm also posting with the St. Patrick's Party at a Holiday Haven so make sure you click through the favicon on the right. 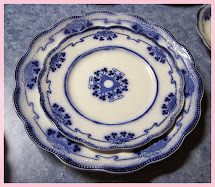 When I first saw this china, I thought of a hundred different ways to set the table. It screams 'baby shower' and 'springtime'! 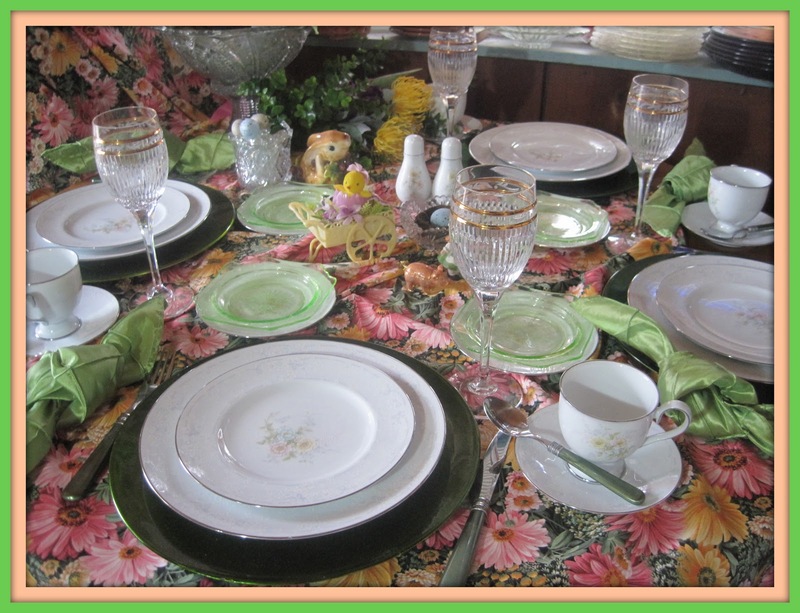 For this table, I couldn't decide if I wanted to feature Easter ... or St. Patrick's Day (since the china was made in Ireland) so I did a little of both! 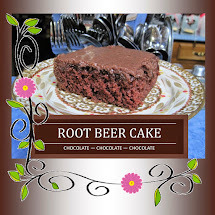 Hope you enjoy ... and always take the time to visit my home page so you can see all my other posts! I have a neat Federated Women's Club post this week. Isn't this pattern, called Anticipation, delicate? 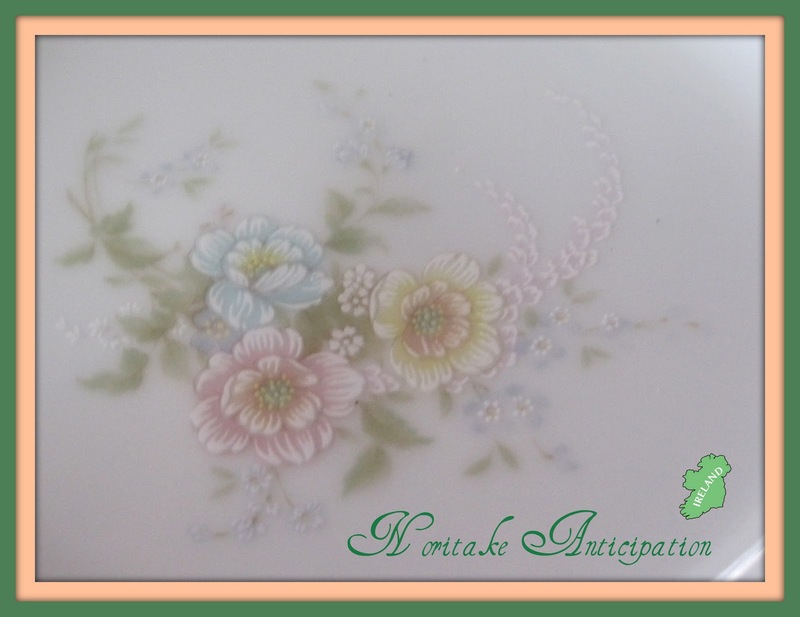 Yes, Noritake originally was made (1904) in Japan, but their more usable dinnerware is made in Ireland. Unlike the beautiful bone china, their Versatone china and their Keltcraft earthenware are made in Ireland. This dinnerware is freezer, microwave and oven proof ... and dishwasher safe. 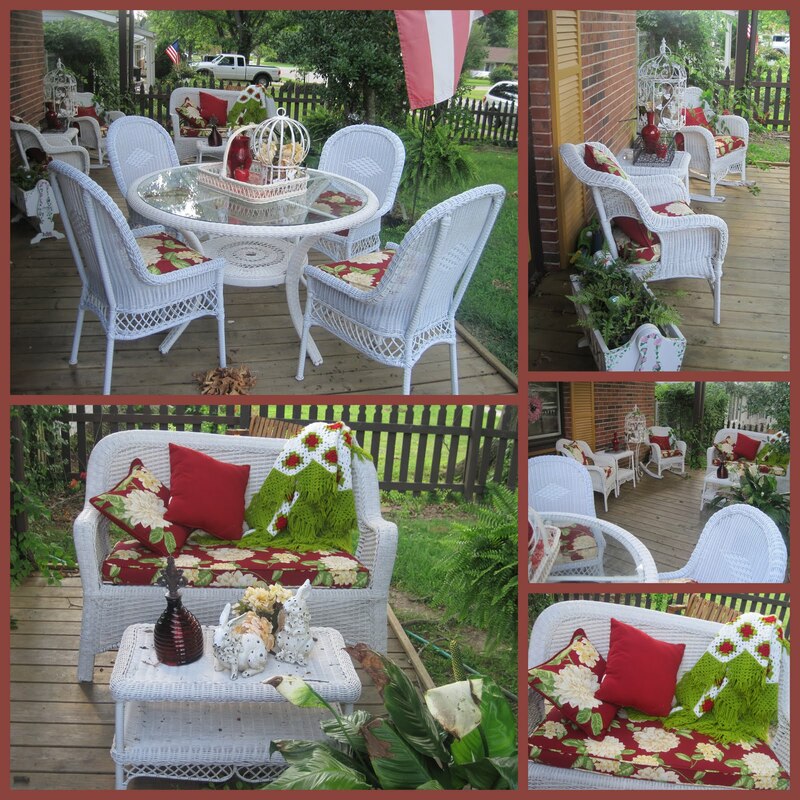 I set this on my little round table in the sunroom, so it is cluttered and crowded ... just the way I love it. Look at the border of the pattern ... pretty delicate. 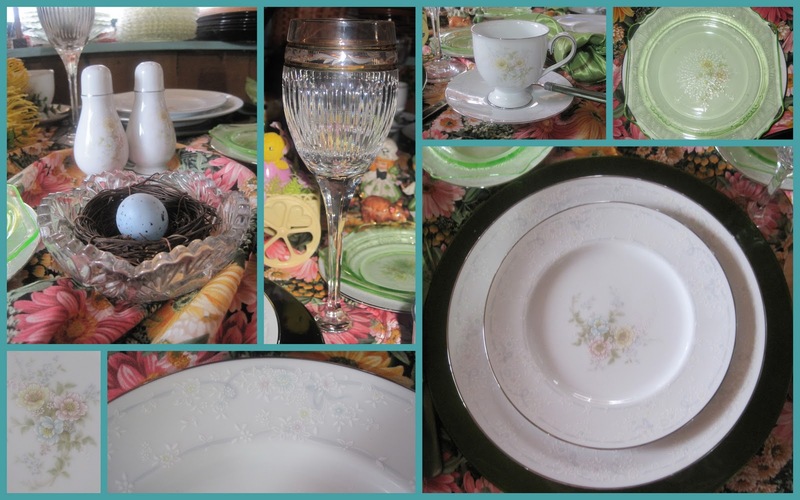 The stemware is Mikasa and you know I cannot set a table without using some Depression Glass, so I used a Princess green bread and butter plate on top of the Anticipation plate ... for no reason other than color! I love the shape of the cup and the salt and pepper. The centerpiece for this table is created in a two-piece punch bowl ... probably ca. 1920s or 30s. It is pressed glass, and the spooner and the small nappy are similar patterns. 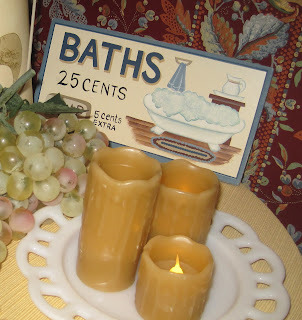 I just love old pressed glass ... and I never care if anything matches ... you already know that about me! 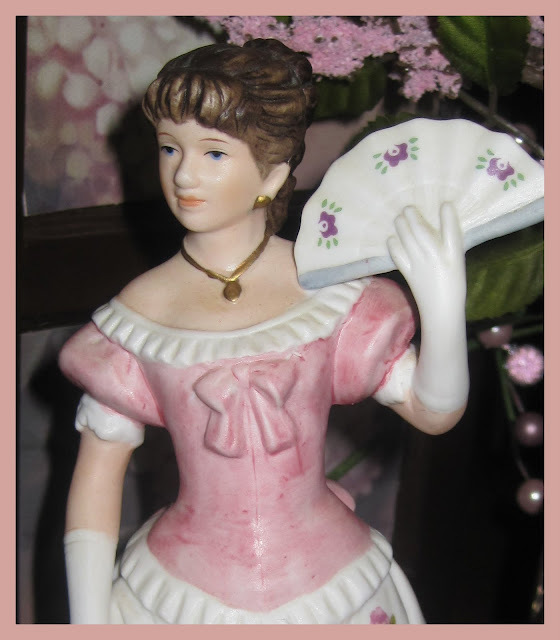 I bought this cute little piece at the museum shop ... and it is probably from the 1950s or 60s. It is all plastic ... with turning wheels! I've had to hide it from Miss Phoebe ... or it will go in the doll house! Here's a little touch of Ireland ... the figurines are Lefton ... and on almost every table I set ... I hide a pig in plain sight! 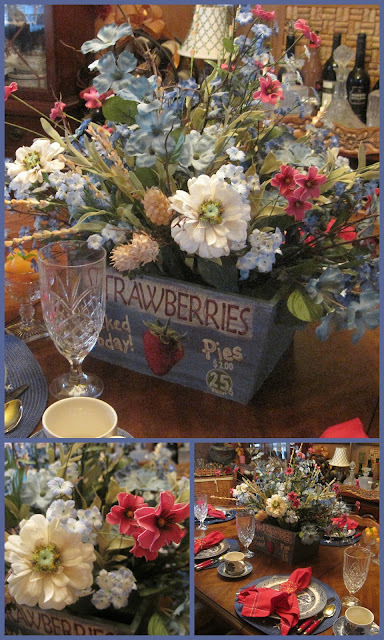 Hope you've enjoyed my tablescape ... Just can't wait for spring to really get here! It was 52 degrees today in Southern Illinois ... but it could snow tomorrow! That's the way the weather is in my neck of the woods! I'm participating in Pink Saturday and I'm actually reposting some photos from last Summer! Hope you don't mind ... they are pretty and pink! 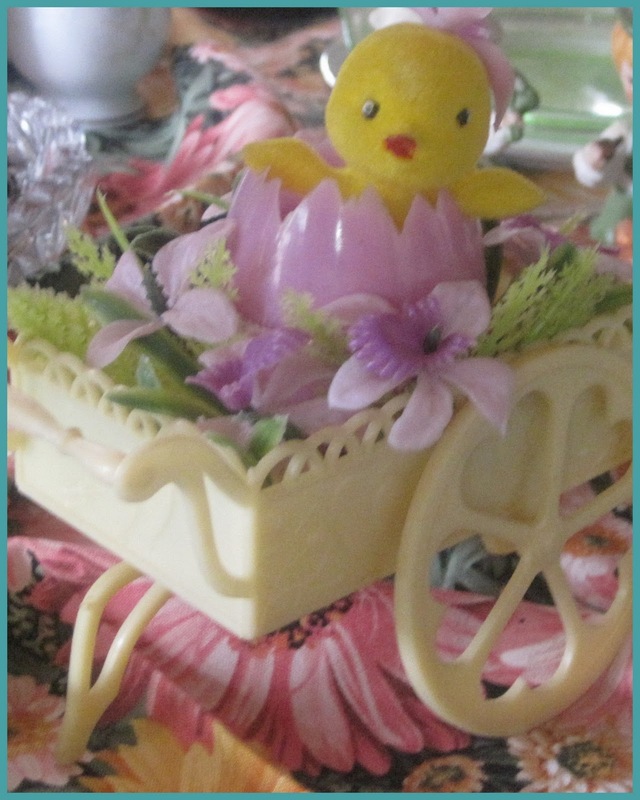 Here's a little bit of my collection of Depression Glass ... and my collection of doll sized wicker furniture! I love to use it as centerpieces. Hope you enjoy! Happy Pink Saturday and as always, thanks to our hostess! 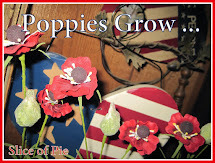 Hope you'll take time to visit my home page and see my other posts. I'm in the mood for cooler evenings with a pot of coffee! Southern Illinois' heat indexes are preventing me from doing that, though ... so I'm just pretending. I've set a cute everyday table with the dishes I use all the time. This isn't an advertisement for QVC's Temptations kitchenware ... but if you have it, you know why I love it ... and if you don't have it ... you might want to try it! 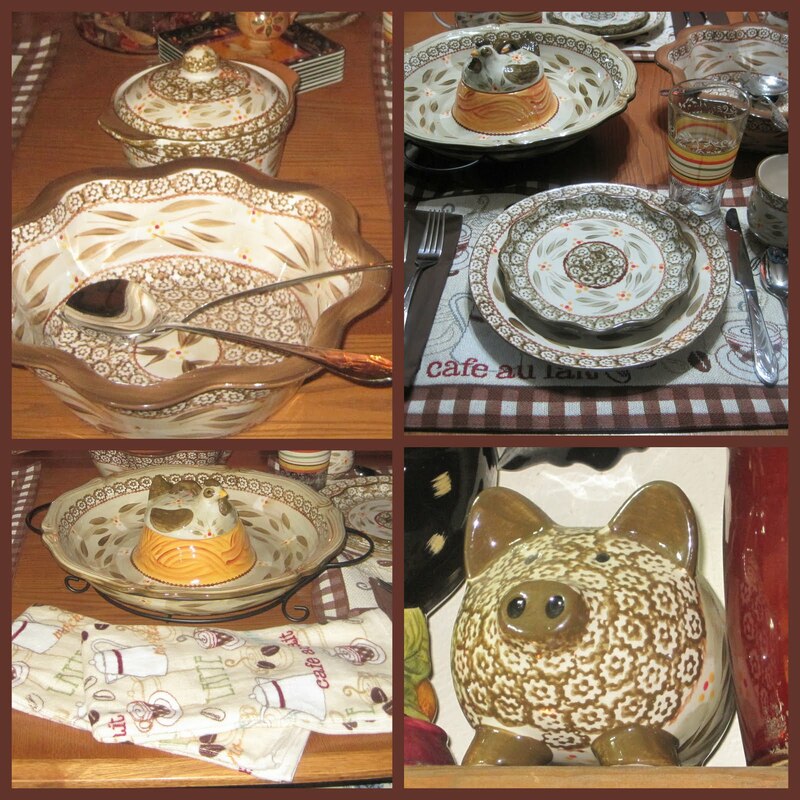 I have the dinnerware in brown ... and I've bought zillions of serving pieces and special things. I have everything from individual casseroles to a vertical chicken roasting pan. this stuff is freezer, oven, microwave ... and kid proof! It comes sparkling clean in the dishwasher, too! So, we'll start with my make believe coffee in the evening centerpiece. 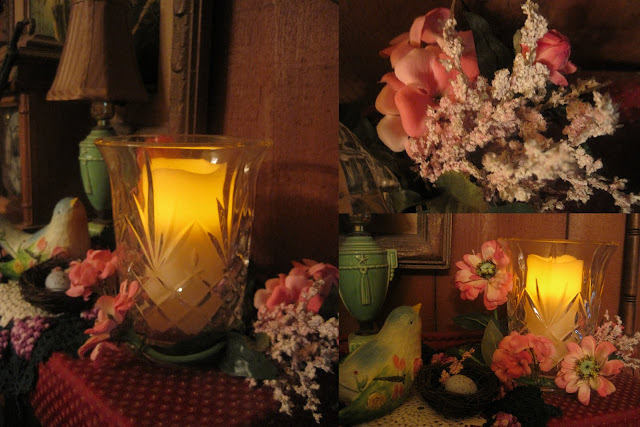 I've recently repositioned my kitchen table and I'm enjoying creating little vignettes on the end of the table .. instead of the typical centerpiece! I'm linking with Tablescape Thursday ... Let's Do Brunch and Tabletop Tuesday so make sure you click through to the parties and the other posts! Special thanks to our hostesses! 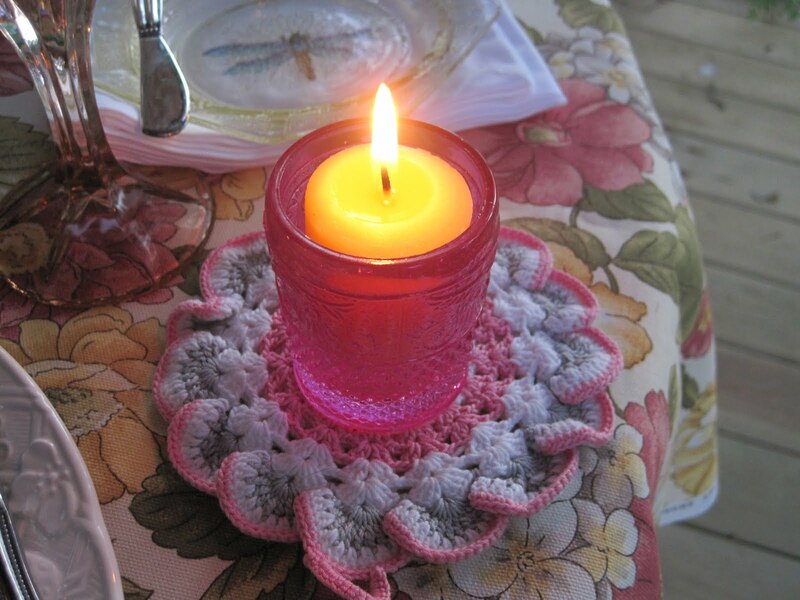 Take a look at this cute place setting! Tablescapers will recognize that cute Dollar Tree glass! Those are kid proof, too! 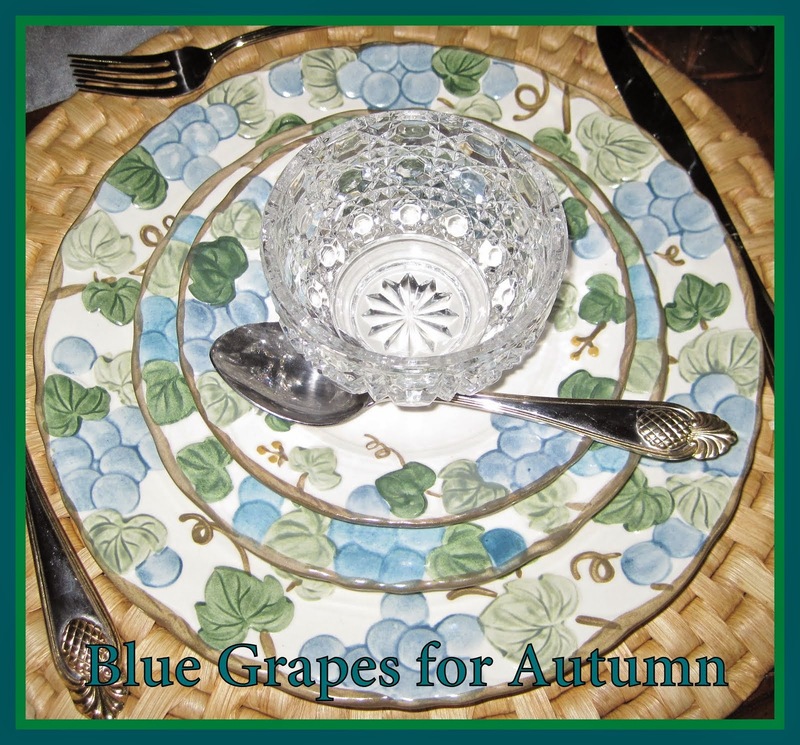 The colors on it are perfect with this dinnerware ... and I love the sentiment on the glass ... It's all about family gatherings! The place mat and napkin are a Walmart find! Nothing expensive here ... just friendly and inviting. 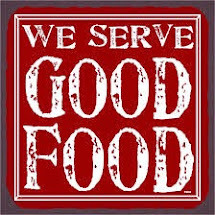 Perfect for any meal ... including brunch! 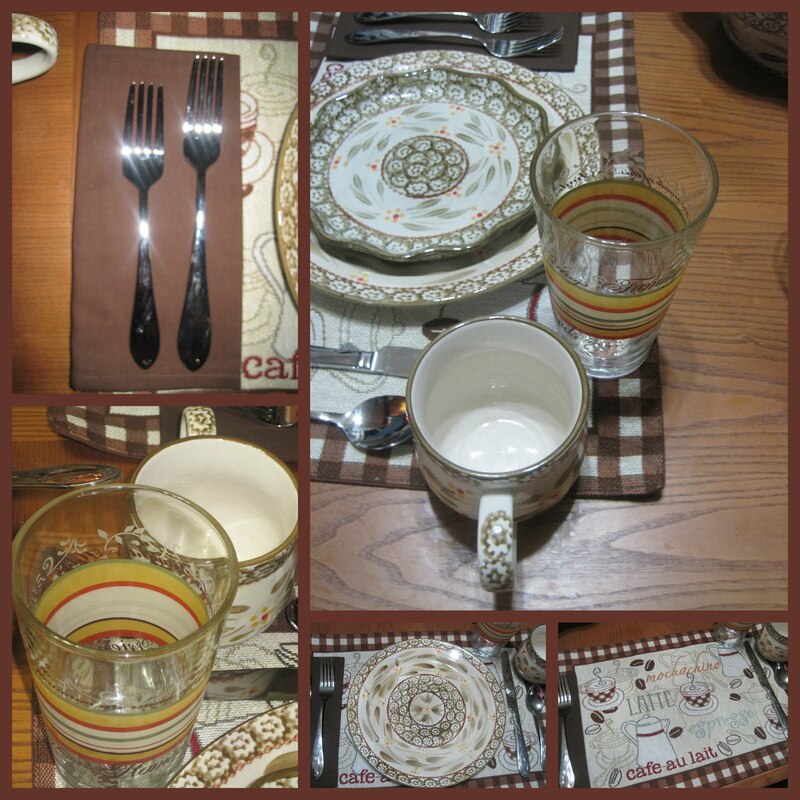 I love the brown and white check on the edge of the coffee themed place mat. Take a look at the cute shapes on these things! Sponge painting is a very old ... probably considered primitive ... technique. Don't you love the scalloped edge of the salad bowl? Then the dessert or salad plates have a similar ruffled edge! The chips and dip dish .. .with the nesting hen ... is one of my favorite pieces ... and the salt pig has a special place in my kitchen! Here's a closer look at those special edges ... and a special old man in the picture! That's my daddy. This picture was taken on Father's Day the year he was 88. He jumped on one of my brother's horses before anybody could stop him. 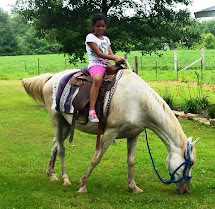 We didn't think he needed to be riding at that age ... but nothing ever stopped him! He'd worked with horses ... and loved horses ... his entire life and he was as comfortable on that spotted horse as he would have been in the lounge chair in his TV Room. 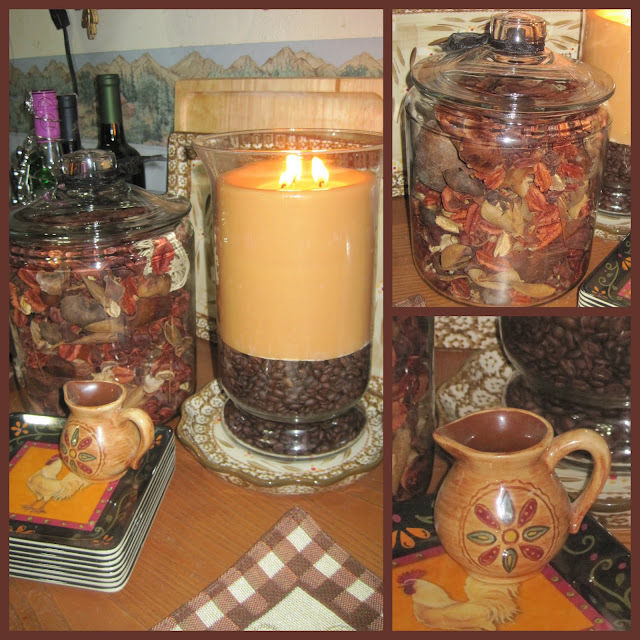 This is a quick little coffee niche creation ... a coffee scented candle dropped down in a hurricane on top of coffee beans ... cinnamon scented potpourri in a big jar ... and a cute little pitcher that my daddy gave me one time. I was his baby child and he loved to have 'treats' in his pocket for me ... when he was in his 80s and I was in my 50s ... this was still a favorite thing of his ... to have a treat for me when his visited my house! 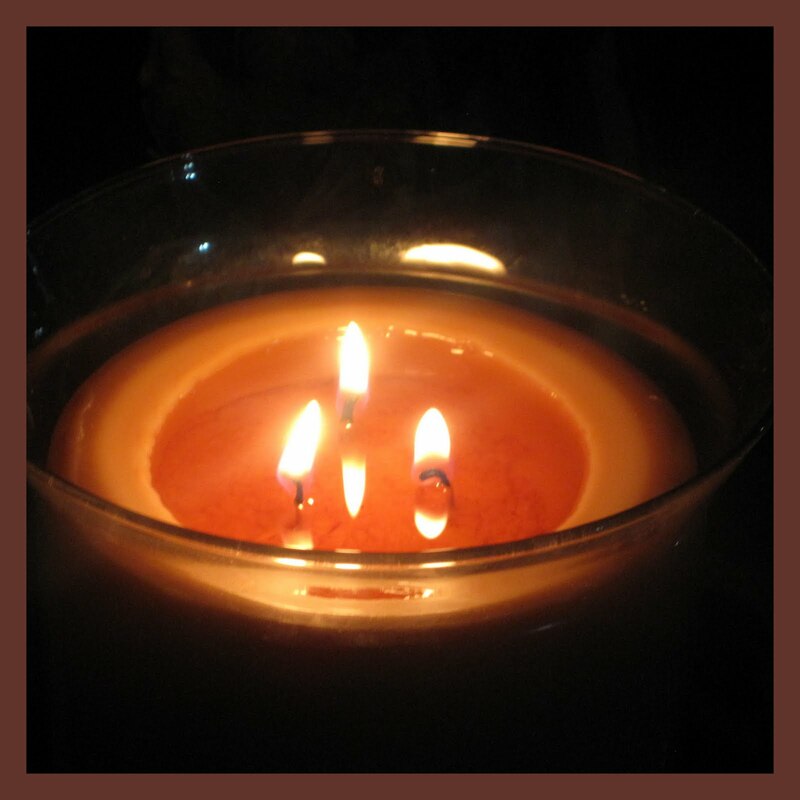 What's more beautiful than a gleaming candle in the darkness. What a great scent is coming from this pretty thing! 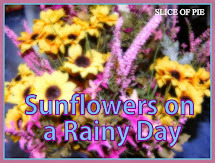 Hope you enjoyed ... and hope you'll visit my home page to see my other posts! 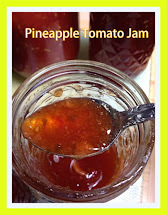 Here's a great brunch recipe! Place half an avocado in an individual casserole dish. Place a poached egg in the center. Top with a drizzle of bottled enchilada sauce and a healthy sprinkle of shredded Jack cheese. Place under the broiler for a couple minutes, until the cheese melts and bubbles. 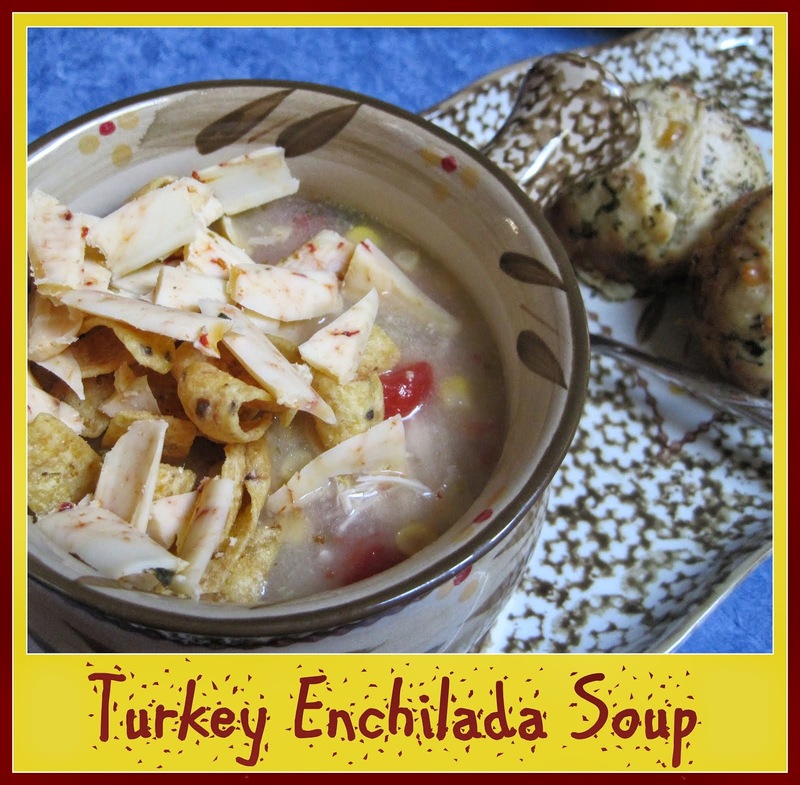 Serve immediately with a side of fresh fruit, a yummy corn muffin and a mug of good coffee! Summer Cloche Party on the Porch! I'm excited to participate in this week's Summer Cloche Party at a Stroll Thru Life! 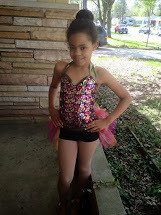 Make sure you click through to see all the other posts ... and special thanks to our hostess. 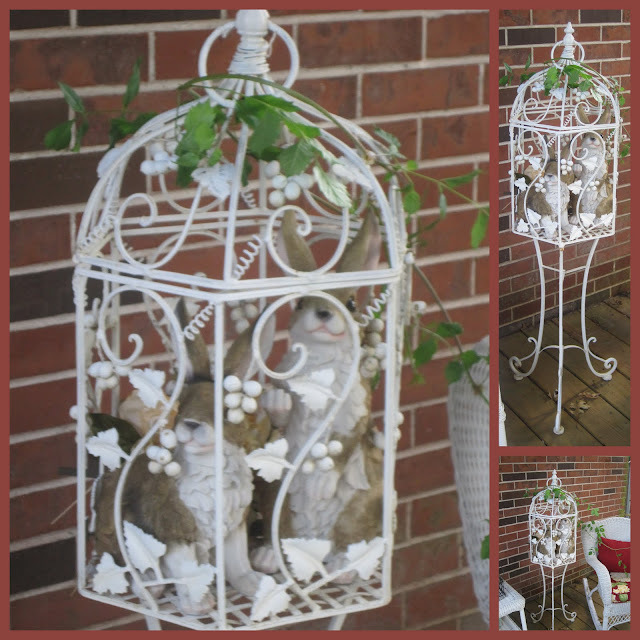 I'm excited because I'm finally unveiling a little re-do of my front porch ... since I have a couple of cute cage cloches! I'm featuring lots of things that I've acquired while 'junking' as my dad always called it! Hope you enjoy! You'll notice that I'm ready for Autumn! 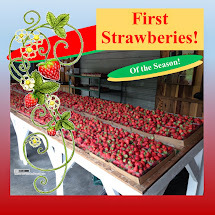 It's been pretty hot lately and a few days of cooler temperatures would be welcomed ... but it's wishful thinking! I splurged on new cushions for everything and I love the deep red background of the fabric. The flowers are creamy beige and soft yellow mums and geraniums and look nice with my gold shutters. I also finally found the dining chairs that I've been looking for ... for a couple years. I bought the table without chairs, because I didn't like the ones that were featured with it! Pier 1 had the perfect chairs this season! This gorgeous wrought iron cage on a stand is one of my collectible store finds. I brought it home and put it on the porch. It didn't need any repairs or a paint job. Miss Phoebe thinks we should keep our rabbits in it! 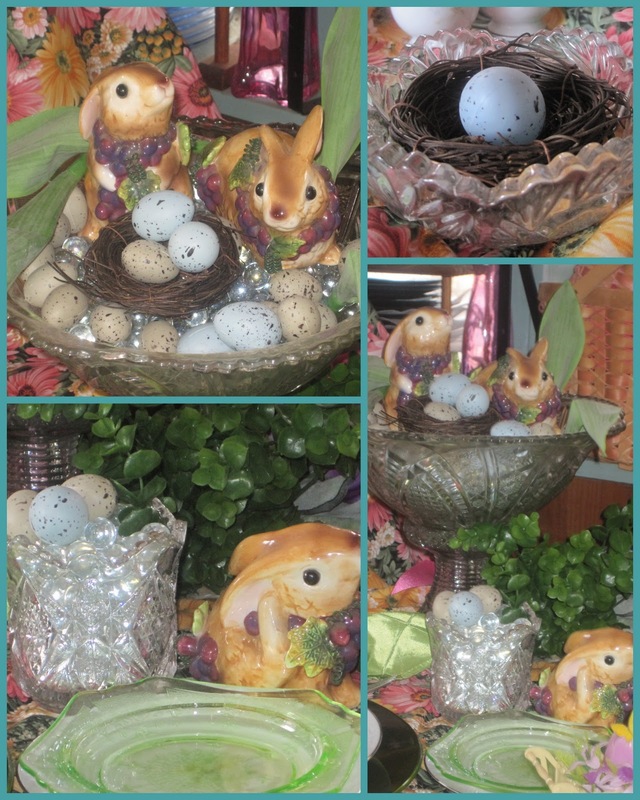 This cute basket and the cage are from GoodWill! The basket is outdoor wicker with a plastic lined bottom. It is perfectly outdoor proof. These cute chairs all came from GoodWill ... except the pottie chair! Aren't they cute? The three bears would be pretty comfortable! I always have pigs on display someplace! I bought this chair with intentions of painting it ... but I liked the original paint job ... so didn't touch it. 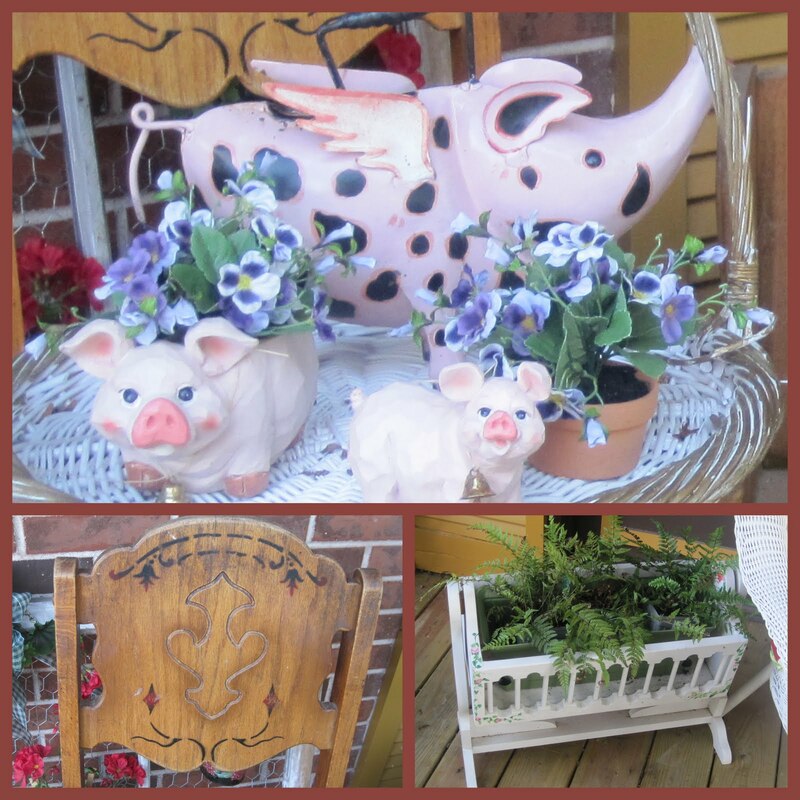 I've filled the little doll cradle with ferns ... and the cradle came from GoodWill, too! So, here's the porch, complete with a couple cage cloches! 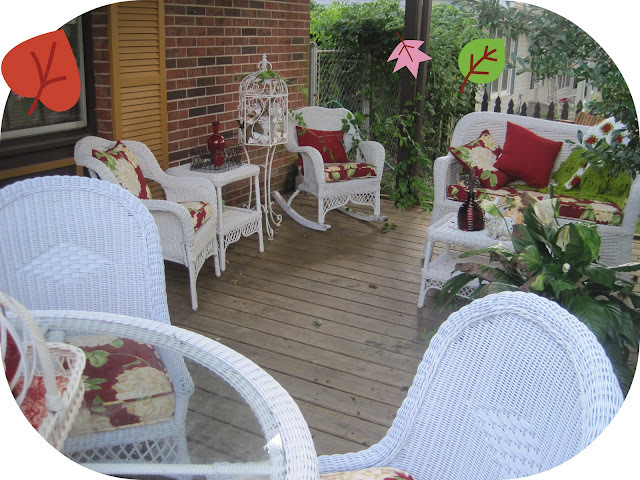 It's been too hot to spend much time on the front porch ... but Autumn will come! Today, I went on a girls' outing to a neighboring state ... to an antique mall we love and I specifically shopped for Pink Saturday! 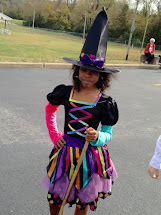 I'm linking with the party, so don't forget to click through to see the other posts! I set up this cute vignette on the end of my kitchen table! I'll enjoy looking at it for awhile. The figurine is what first caught my eye. I loved the layers of ruffles on her dress! Then I found the cute trinket box ... and then I found the Johnson Brothers creamer in that beautiful soft pink color. If they'd had a whole set of those dishes ... I would have hauled them home! 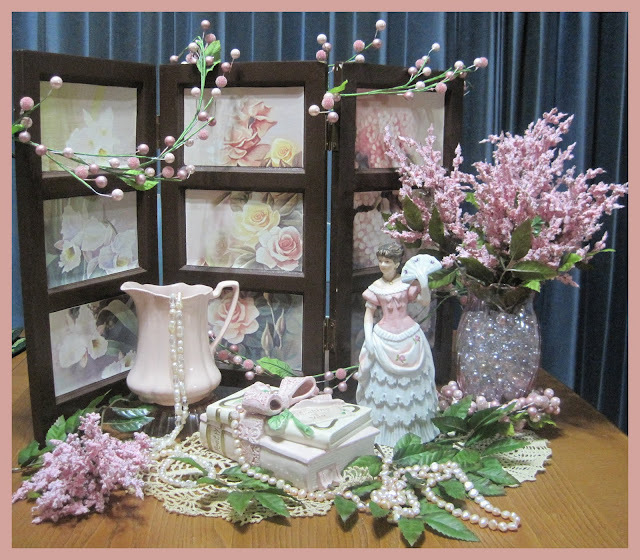 Now ... the gorgeous big pink pearls in the lower left of the collage did not come from the antique mall. I've had a live-in jeweler for 35 years! My husband ... as a hobby ... has always worked with jewelry. He's strung .. and individually knotted ... pearls for me in every color. These pink ones are my favorite! Happy Pink Saturday! 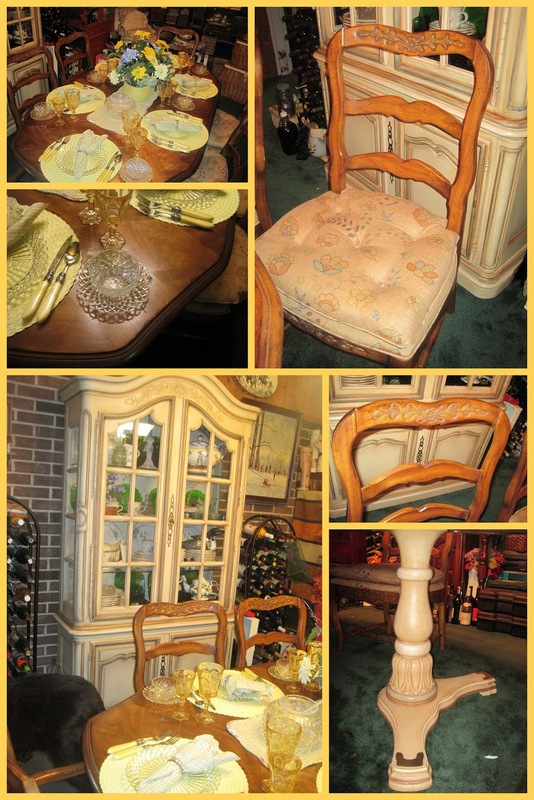 If you haven't seen my new dining room furniture, go to my home page and take a look at my other posts! Don't we love our blogging friends?!!! It's Celebrity Chef party time and I'm joining in with Lynn and Earl! Make sure you click through to visit all the other posts! 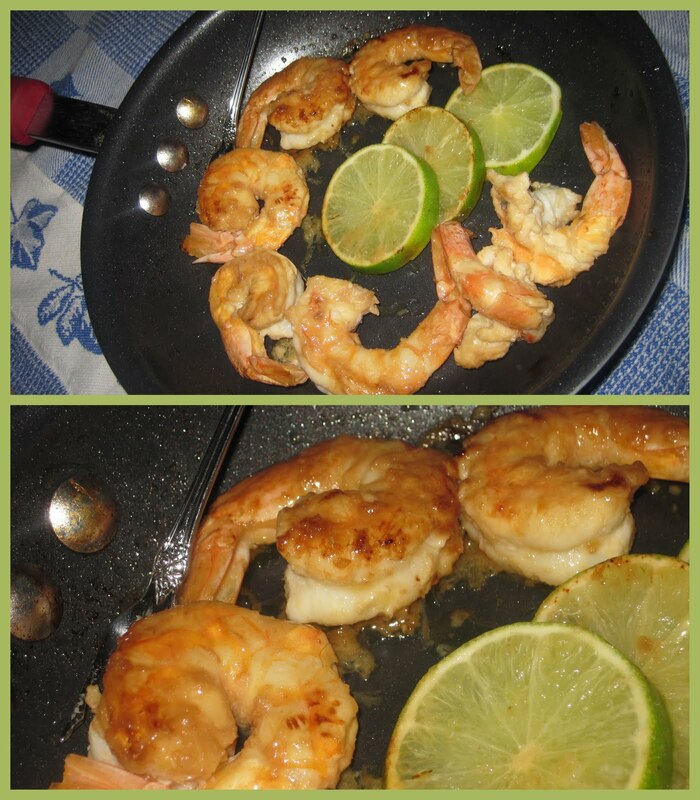 This quick and easy recipe was inspired by one of Bobby Flay's many grilled shrimp recipes ... lots of lime juice! I quick fry them in good olive oil like I do Shrimp Scampi ... and sure don't have any problems enjoying them! They are great with a little rice or pasta ... or just by themselves. Peel and de-vein 8 extra large shrimp (16 count) and dry them off a little. Prepare a marinade by mixing the juice of one fresh lime, grated zest of the lime, 1/2 teaspoon each of minced lemon grass, minced garlic and minced ginger. (I buy those in the produce section in plastic tubes.) Toss the shrimp in the marinade and let it sit for 20 minutes. Drizzle a little lemon infused olive oil into a hot skillet and immediately throw the shrimp in. Saute them quickly, turning just once and pour the remaining marinade over them. Turn the heat off, but add a few slices of fresh lime and let the shrimp stand for a couple of minutes. They'll absorb all the juices and warming the lime slices allows them to release a great flavor. 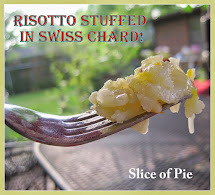 Serve them warm as an appetizer ... on top of a fresh garden salad ... with pasta tossed in olive oil or with rice. It's quick, easy and really good. Just wanted you to see how I freshened up my little bathroom! You've seen it before and you'll recognize the autumn leaves wallpaper ... which I love, love, love! A little soft yellow makes it look like summer! There's room in the hallway bath for a little round table, which is fun to decorate. 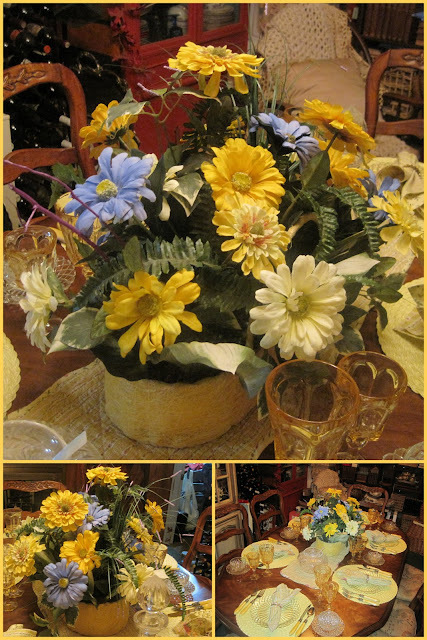 I just added a few silk flowers in the yellow tone with some things I took from other places in the house! Mr. Big Bear is holding up a stack of vintage books ... and I added a few ceramic birds to the vanity top and to a little shelf. 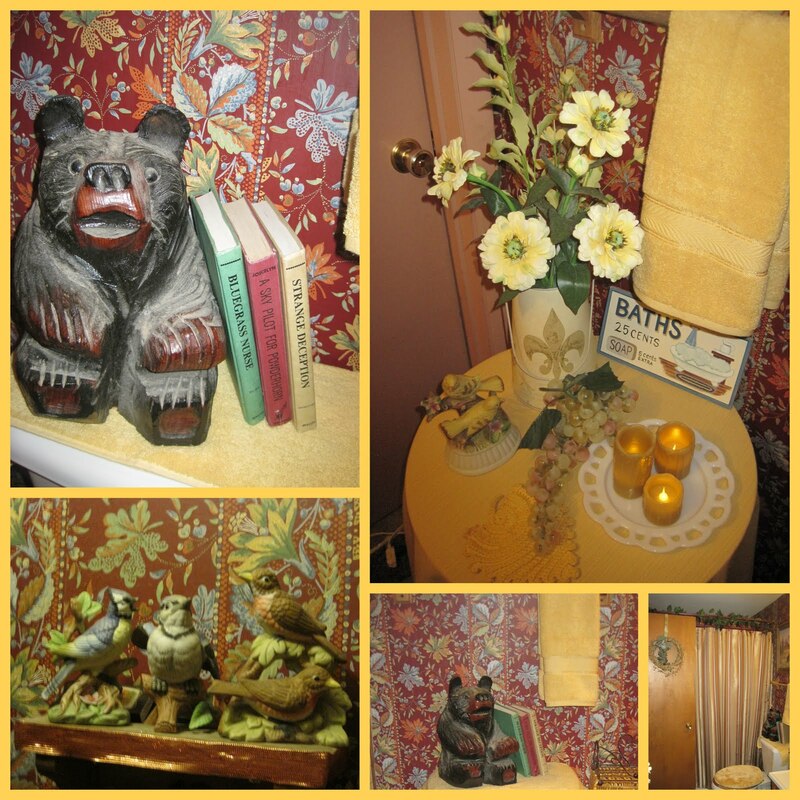 I switched out the shower curtain to stripes with a butter yellow background ... and everything seems fresh! I do have a honeysuckle jar candle in the room, but also enjoy battery operated candles clustered on the little table. I didn't spend much money, but got a fresh look! 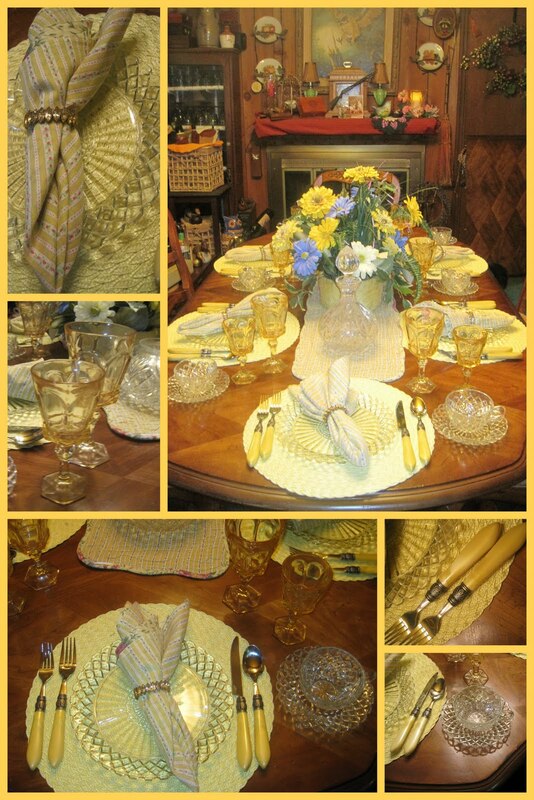 You might want to go to my home page and check out my new dining room, too .. . more soft yellow tones in my tablescape! I'm linking to Tabletop Tuesday so make sure you you click through to visit all the other posts. Thanks to our gracious hostess! 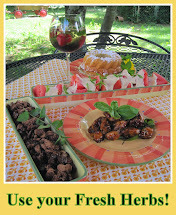 If you're looking for some fantastic cookies that use fresh herbs in the ingredients ... check out my Made at Home Cooking Column from years past in the Southern Illinoisan! 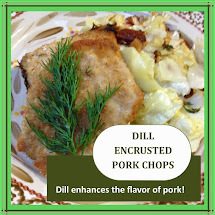 These are easy to make ... and very good! 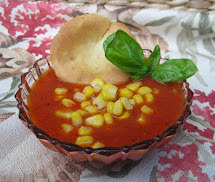 I've added the recipes below the picture, if you want to skip the article! Cream butter and sugar, adding eggs; blend well. Sift flour, cream of tartar and salt together and slowly blend it into the creamed ingredients. Stir in thyme and lemon rind. Cover dough with plastic wrap and refrigerate 4 hours. Roll dough on a lightly floured surface and cut it into wafers. Bake on a greased cookie sheet for 10 minutes at 350 degrees. Remove from the cookie sheet while still warm and completely cool on a rack. Makes 4 dozen. Cream butter and sugar. Sift salt and flour together and add slowly to the butter mixture. Wrap and chill dough for 1 hour. Roll into small balls; roll the balls in additional sugar and place on greased cookie sheets. Bake at 350 degrees for 12 minutes. Cool on a rack. Makes 3 dozen. Cream butter, sugar and eggs. Add extract and orange peel. Sift together the flour, baking powder and salt and add to the creamed mixture. Mix in caraway seed. Wrap and chill dough 4 hours. Roll into small balls and place on greased cookie sheets. Press each ball slightly. Bake at 350 degrees for 10 minutes. Remove to a rack to cool. While still warm, drizzle with glaze and sprinkle with caraway seeds. Makes 5 dozen. Cream butter, sugar and egg. Add extract, lemon rind and lemon juice. Sift flour, baking soda and salt and gradually beat into the creamed mixture. Stir in the chopped sage leaves. Wrap and chill dough for 1 hour. Roll into small finger shapes and place on a greased cookie sheet. Bake at 350 degrees 12 minutes. Transfer to a rack to cool. When cool, dip ends of cookies into a glaze. made with 2 cups of powdered sugar and the juice of a small lemon. Makes 5 dozen. Just put a little pink in the dining room ... on the mantel ... make sure you scroll down and look at my new dining room furniture! 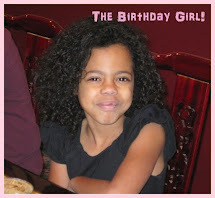 I'm linking with Pink Saturday , so make sure you click through to see the other party posts! I'm excited to post one of my most recent purchases ... a new dining room set ... Drexel Heritage ... table and chairs and a great china cabinet. 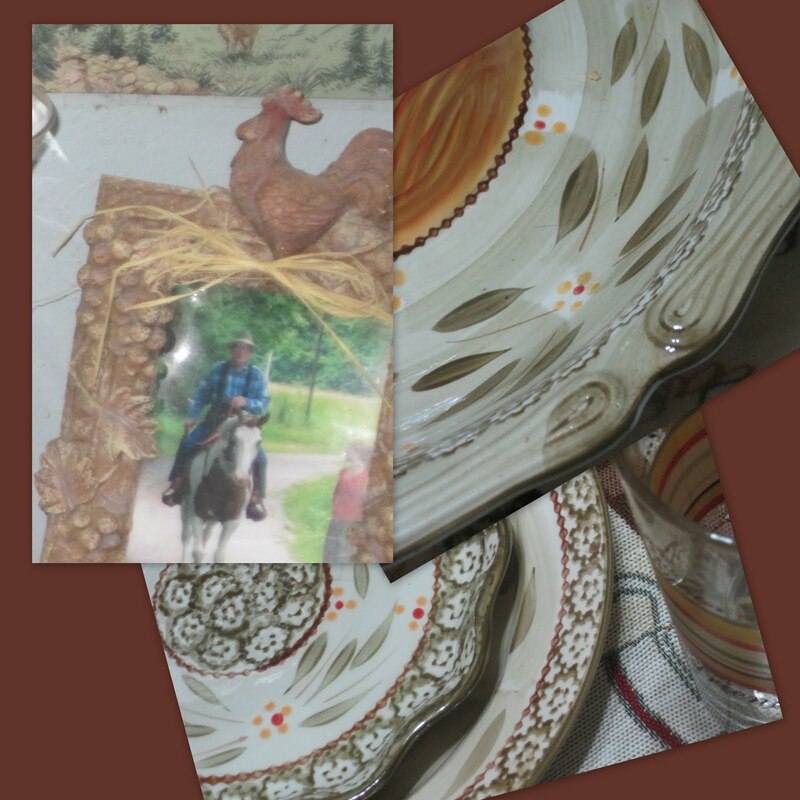 I didn't need a new china cabinet, but it was a beautiful complete set and I didn't resist. 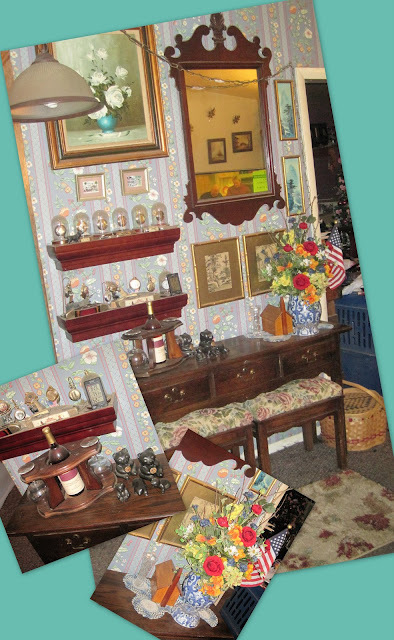 My good friend George has an antique and collectible shop and he always has fabulous furniture. My sister-in-law and I sat at the table for 30 minutes before I decided to buy it ... then George said, "Did you see the matching china cabinet?" Well, the moment I saw it ... I bought it all. You gals that love Country French will love this furniture. 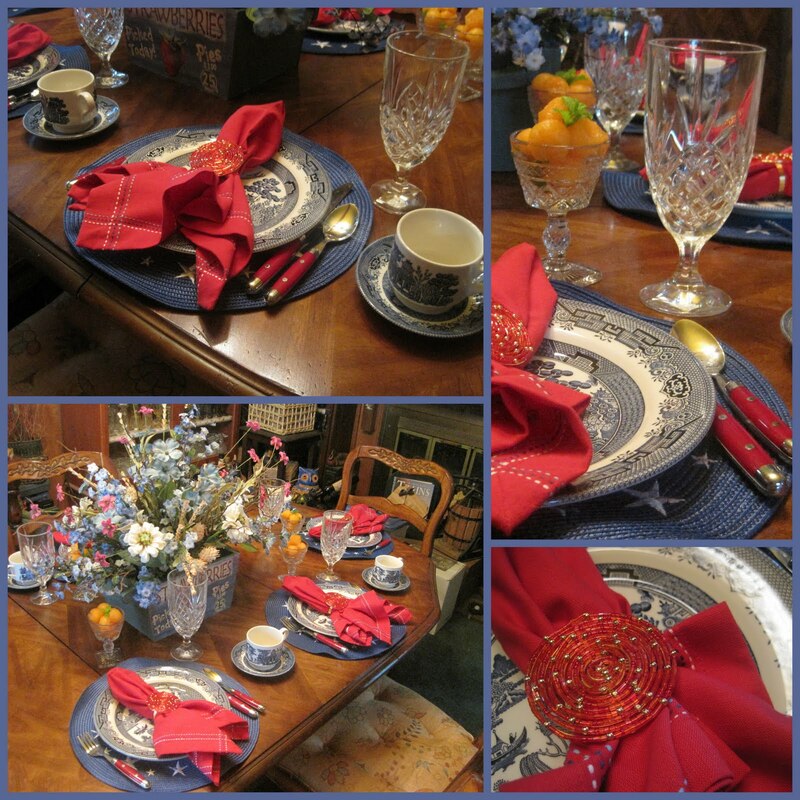 Take a look, then scroll down to see the rest of my tablescape! I think I'll never cover this beautiful table top! I'm enjoying adding pale yellow and blues to the dining room. It's always been all about the colors of Autumn. 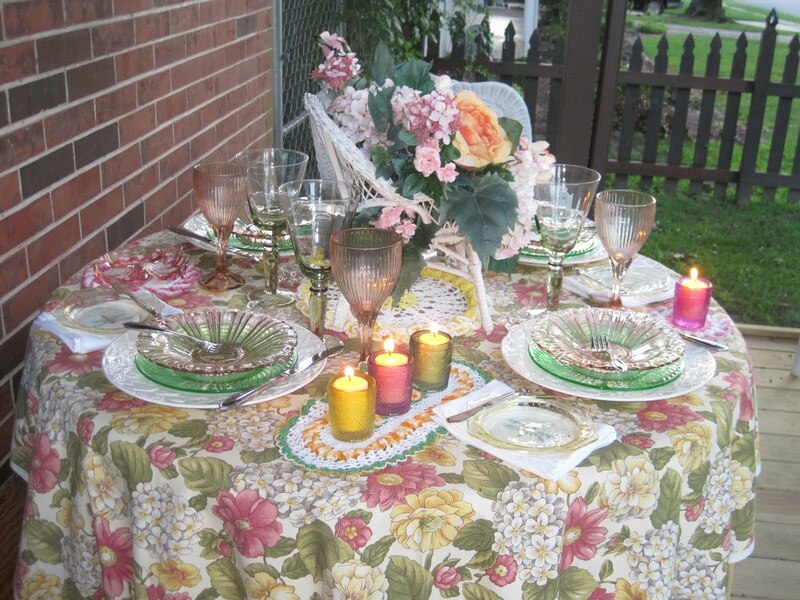 The dinnerware on this tablescape is from a flea market! It's Depression Glass .. .called Waterford Waffle ... but not Waterford crystal. It was made to compete with Waterford ... so the middle class could afford something like crystal! The Fostoria stemmed glasses have been in my collection for 20 years! 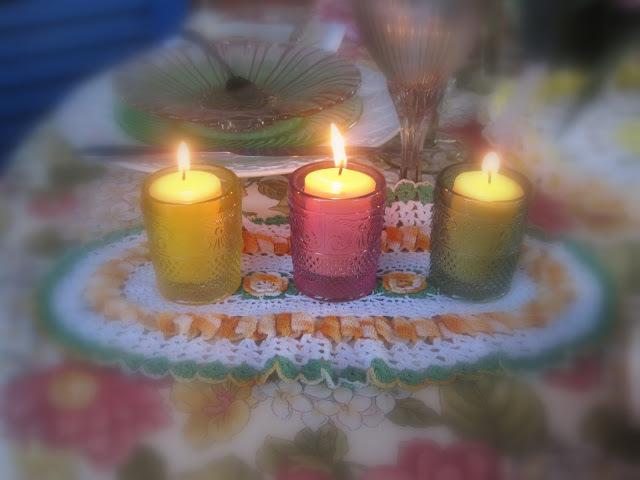 The other part of this table that was a great thrifty find ... the napkin rings. They are probably 1950's ... yellow rhinestones. I love them. 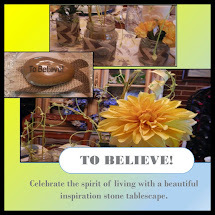 I'm linking to Tabletop Tuesday and Tablescape Thursday so make sure you click through to the parties to visit the other posts! As always, special thanks to the hostess of each party! 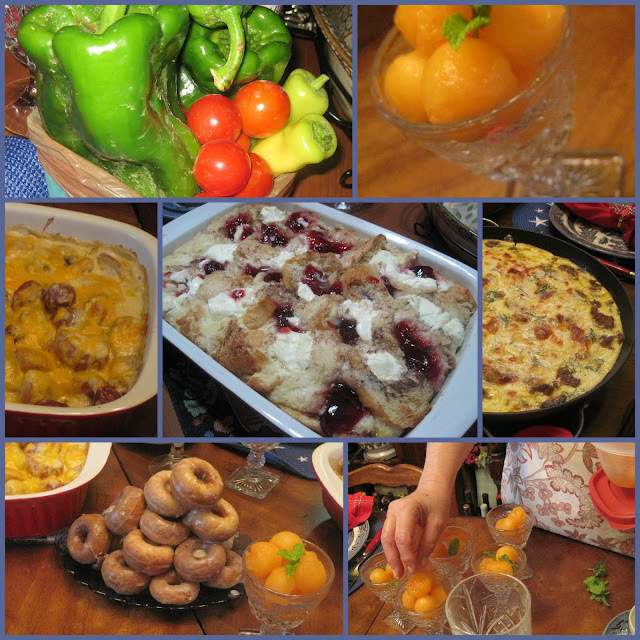 Here are a few pictures of my recent brunch ... on July 4th! I've included one of the recipes, just in case you don't have a really good French toast casserole recipe! This one is so, so good! I love these napkin rings ... they look like big spiral fireworks and work well on a July 4th tablescape! Blue Willow china, red Cambridge flatware and Depression Glass Cape Cod stemmed cocktail glasses for the melon balls ... made a cute setting. 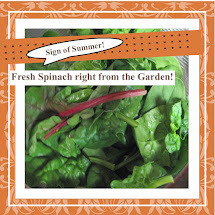 In my circle of friends, hostess gifts of baskets of garden produce are very popular! I've posted the French Toast Casserole at the bottom ... scroll down! Miss Phoebe had a little trouble staying awake after eating a big brunch! She loves sausage and I put it in the egg bake, so we had to kind of pick it out for her ... so she knew she had enough! Mix 12 eggs and 2 cups of half and half together. Blend in a teaspoon of almond extract, 1 teaspoon of ground cinnamon and 1/2 cup of honey. Tear a big loaf of French bread into big chunks and place them in a prepared 13x9 inch casserole dish. Pour the milk/eggs over the bread. At this point, you can cover and refrigerate this overnight ... but making it a couple hours ahead works just as well. When ready to bake this, cut an 8-ounce block of cream cheese and a half stick of butter into chunks and tuck them into the casserole. Cover with foil and bake at 350 degrees for 30 minutes. 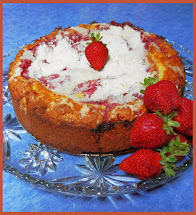 Uncover the casserole and drop teaspoons of your favorite jelly or jam into the casserole. Bake for another 30 minutes until the top browns. Serve it warm. You can serve warm syrup with it ... but it never really needs it! I'm linking with Tablescape Thursday and Let's Do Brunch so make sure you click through to visit all the other posts! As always, special thanks to our hostesses.